Tipperary continued their winning ways with a win that really was hardly a contest. Tom’s put in a lackluster effort and mid way through the first half the outcome was in no doubt. It was not so much that Tipp led by an eight point margin, rather that there was clearly nothing coming from Tom’s that would lead you to think anything would change. 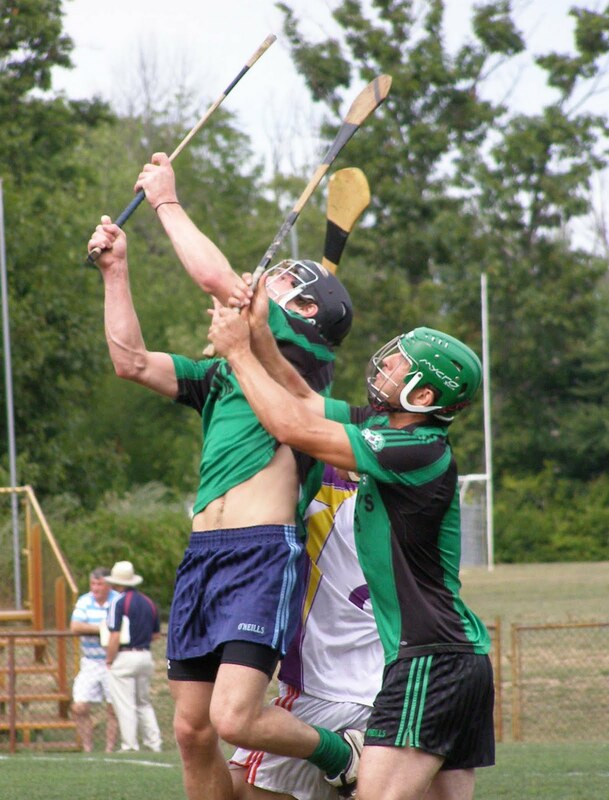 The effort put in the previous week against Wexford was nowhere to be seen. Tipp were limited to the three goals thanks to a great goalkeeping performance from Joe Kane, Kane made some fine saves in each half. 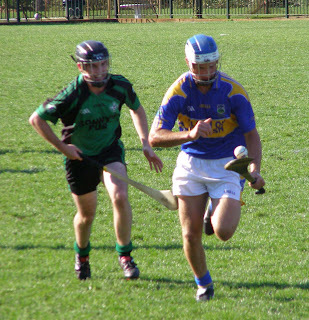 2010 is a season that Tom’s will be hoping to forget – for the senior side at least, the junior hurlers contest the semi-final next Saturday. Tipp had Fr. Tom's on the back foot all afternoon. 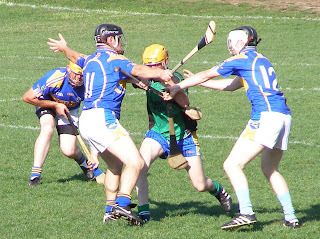 Before we had a chance to browse the team selection in the press box, Martin Boran had a point put over the bar for Tipp. After Eamonn Gleeson and Fran Keenan traded scores to make it two to one, Tipp put any hopes of a competitive encounter to rest. Points came from both midfielders, both corner forwards, and center forward Boran. The goals came in the latter stages of the first half. 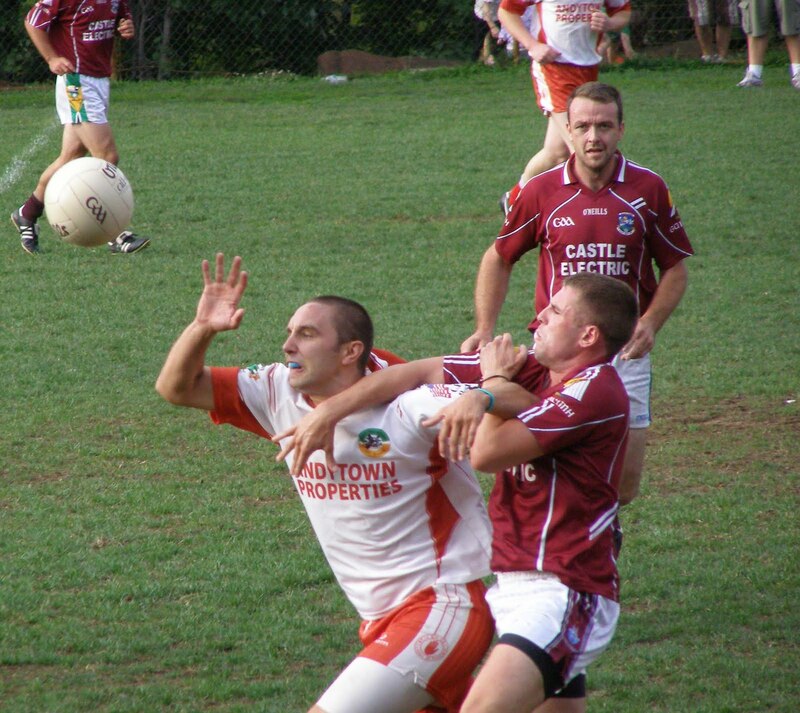 Shane Bourke and Michael Gleeson were the scorers. There was no edge to the game, any ball played out of the Tom’s defence was easily gobbled up and sent right back from whence it came. 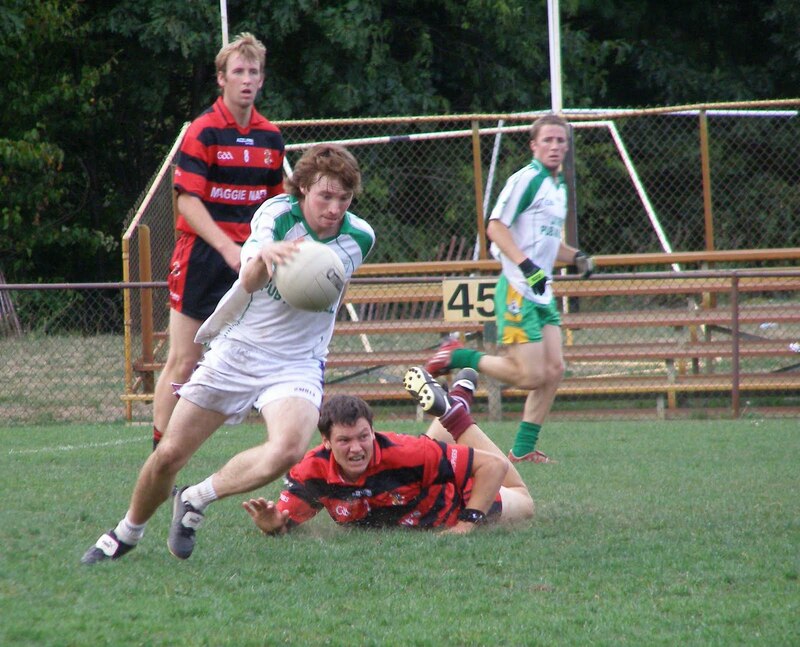 The sliotar may as well have had an elastic tied to it from a Tom’s perspective. Tipp flipped the ball around at ease as the scores mounted. Tom’s managed a flurry of points late in the half from Shane Howley, Gary Brennan, and Lorcan Mulhearn. Paul McGrath got in on the act in the second half getting his name on the scoresheet, and Colin Fennelly netted. Kane made some good saves to keep the goals column from mounting, Tom’s found a fine goalkeeper in Kane this season. Tom’s made their own side of the scoreboard look reasonably respectable with points from Keenan, John O’Loughlin, and a goal from Howley late in the game. 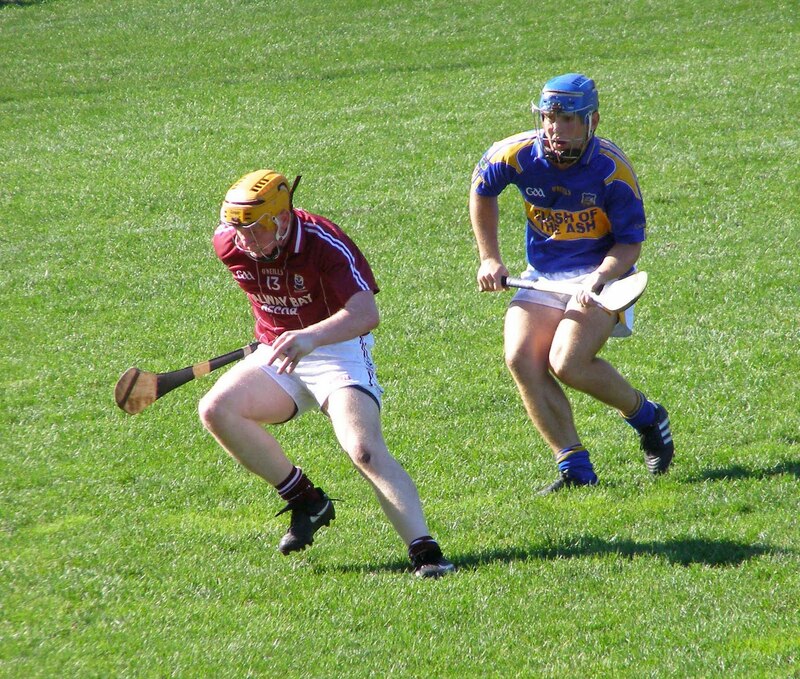 Tipp sail into the final in two weeks time where they await the winner’s of Galway and Wexford. Galway defeated Cork the previous day and with Tom’s losing Sunday, the tribesmen earned their place in the semi-final. 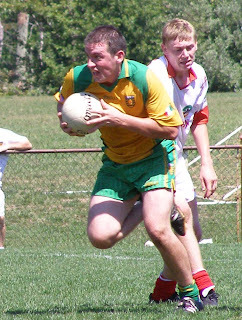 Tom’s: J. Kane, S. O’Brien, J. Dowling, D. Neylon, D. Moore, J. O’Loughlin, T. Kelly, F. Keenan, G. Brennan, G. Reddin, L. Mulhearn, S. Howley, C. Neylon. Tipp: T. Lowrey, J. Kindregan, S. Hickey, J. O’Keefe, K. Joyce, E. Gleeson, C. Dempsey, M. Gleeson, P. McGrath, M. Boran, D. McNicholas, C. Fennelly, S. Bourke. 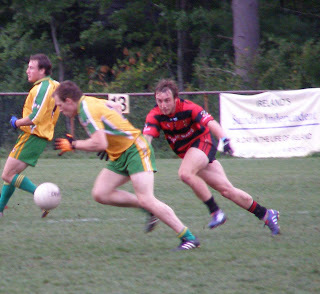 Christopher’s booked their place in the semi-finals with a comprehensive win over the Connemara Gaels. Christopher’s started with a bang. 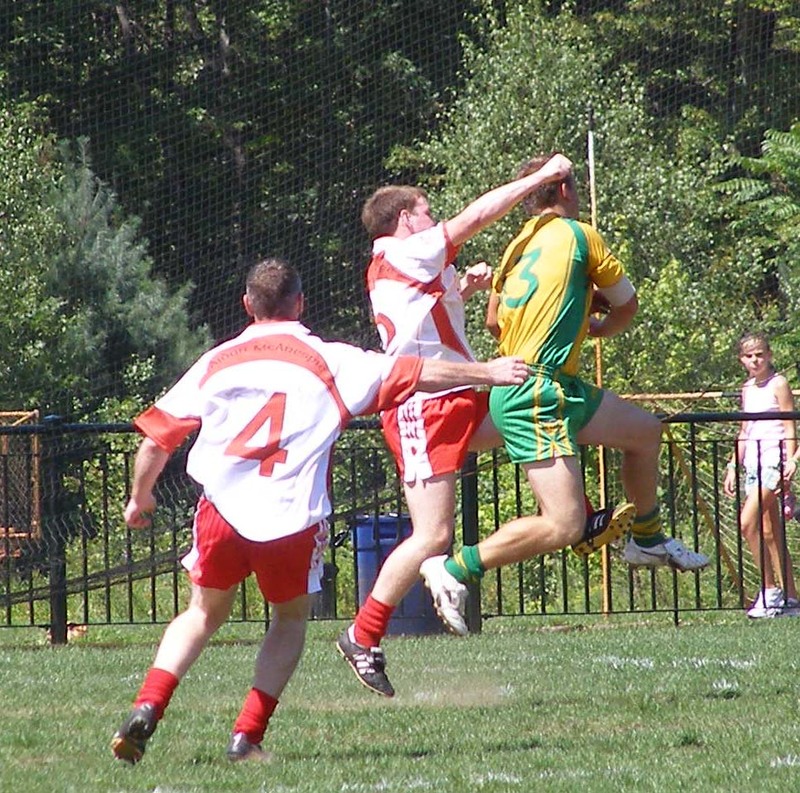 Jerry Kenneally goaled inside the first minute of play and from that point on the Gaels were chasing the game. Early in the second half the Gaels looked like making a game of it, but Christopher’s closed up shop, not allowing the Gaels a much needed goal and maintaining the six-point gap between the teams until the final whistle. 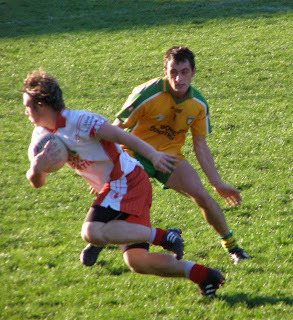 Christopher's Cillian Brosnan and the Gael's Sean Conneely challenge for the ball. Christopher’s got off to the best possible start. Right from the throw in Jerry Kenneally was found on the edge of the small square to blast the ball into the roof of the net from close range. 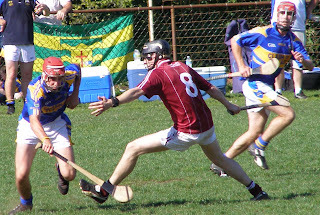 Sean Conneely replied for the Gaels with a point, however, Christopher’s had a decide edge. Christopher’s worked well for each other and the ball was well played into the corner forwards . The Gaels ball movement was not as tight. Coming out of defence there were some sloppy passes, and getting the ball into the dangermen was not as easy for the westerners. 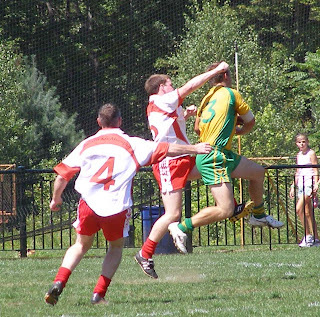 Christopher’s outscored the Gaels six points to two up to the 25th minute. The scoring was well spread. Cathal McNally, Eoin McCarthy, Sean O’Hare, Alan Maloney, and Sean Kelly had a share in the spoils for Christopher’s, while James Donnelly and Martin Coady pointed for the Gaels. Late in the half Jerry Kenneally almost had another goal, but on this occasion Bernard Power stood his ground and was equal to the shot. The sides traded scores as the half wound down, with Christopher’s six points ahead by a score of 0-5 to 1-8. Martin Coady gets away from Ciaran McDonald. The Gaels opened the second half brightly. Pearce Clancy was found on the run clean through and his shot cleared the crossbar by inches. Michael Lundy finished another nicely worked effort, to reduce the deficit to four points. Christopher’s set about restoring their lead, McNally put a lovely point from play over the bar, followed by a free. 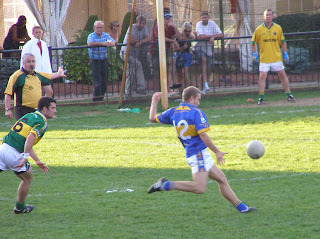 Eoin McCarthy then extended the lead with another point. 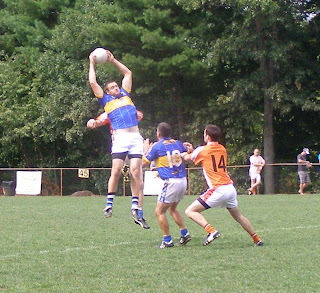 The Gaels could not rein Christopher’s back within reach. 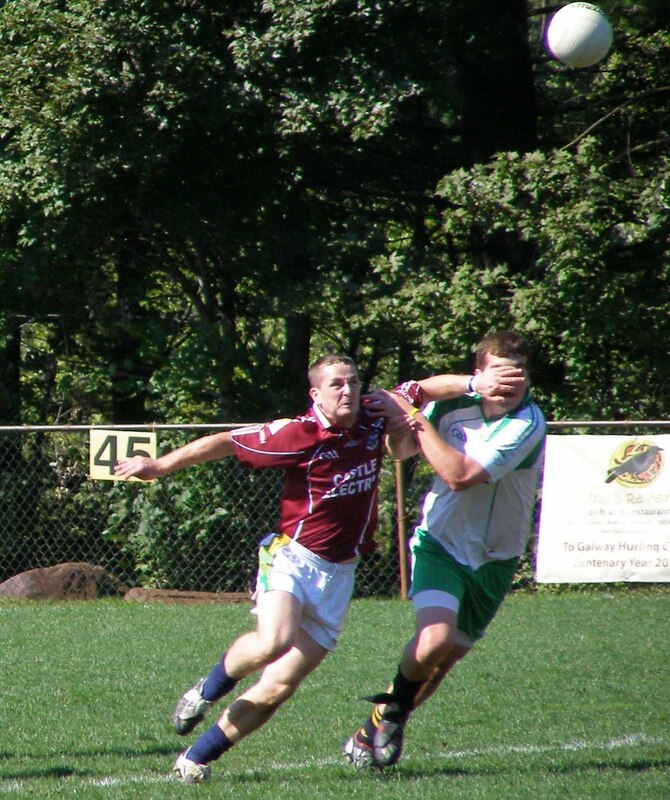 The Connemara men worked hard to find openings in the opposition defence, but Christopher’s did a good job of closing down the spaces. The sides traded scores and after Martin Coady pointed a free the difference between the sides was unchanged from half-time, and less than three minutes remained. 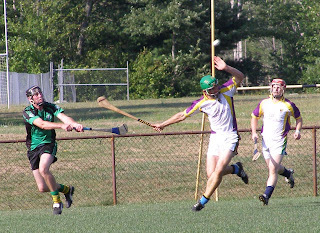 The Gaels went looking for goal and carved some openings, but could not breach a solid defensive wall. 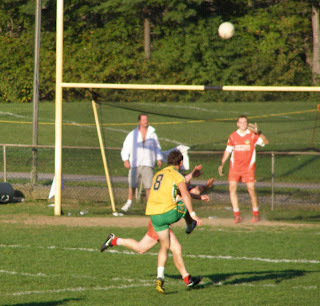 McNally and substitute Eoghan Buckley rounded out the scoring for Christopher’s, while Coady and Dooner pointed for the Gaels. 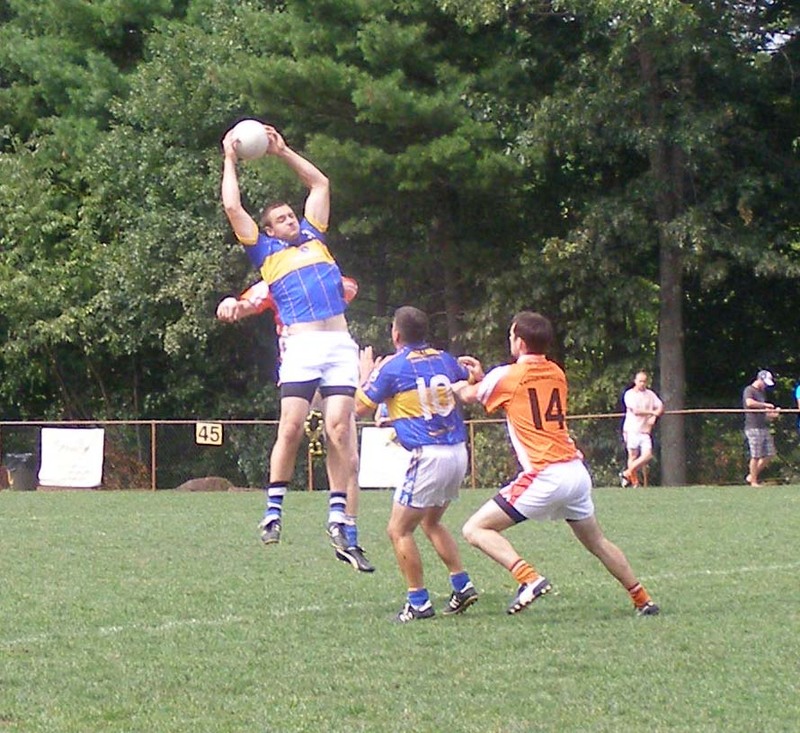 With Armagh-Notre Dame falling to the Blues, the win was enough for a place in the top four. Gaels: B. Power, D. Ryan, H. O’Neill, P. McNicholas, R. Dooner (0-2), S. Cashen, M. Geoghan, M. Lundy (0-2), S. Conneely (0-2), J. Donnelly (0-1), P. Clancy (0-1), M. Coady (0-4), T. McDonagh. Sub: M. Kane (0-1). Christopher’s: P. Kenneally, C. Alyward, C. McDonald, B. Kelly, B. McNally, C. Brosnan, D. Kenneally (0-1), S. O’Hare (0-1), A. Maloney (0-1), S. Kelly (0-2), J. Kenneally (1-0), C. McNally (0-6), E. McCarthy (0-3). Sub: E. Buckley (0-1). 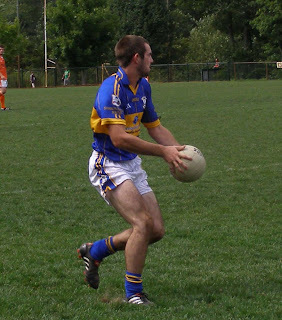 Noel Galvin looks for an option coming out of the Blues defence. 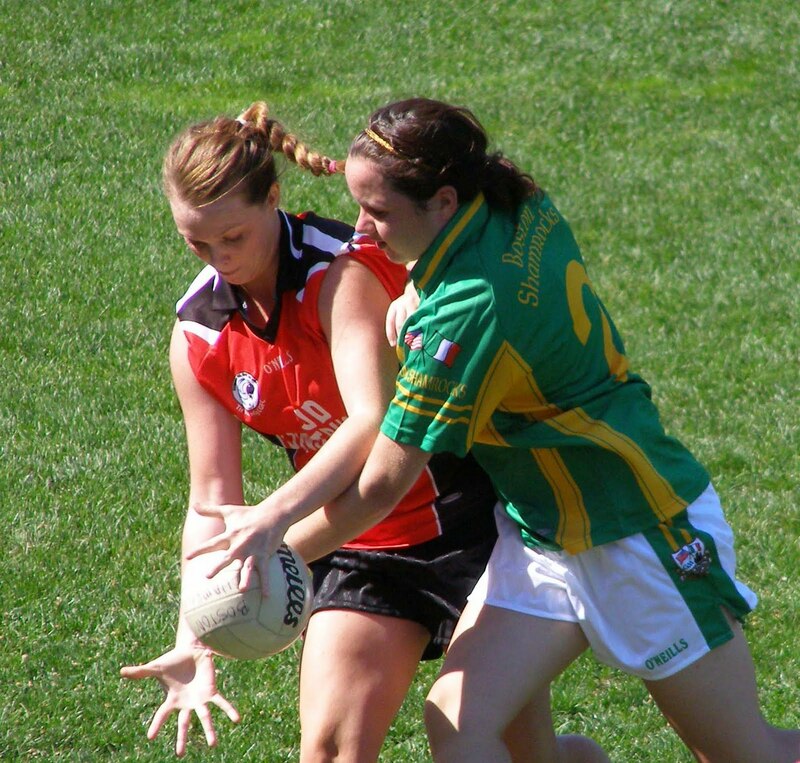 Armagh-Notre Dame’s challenge for senior honours ended tamely on Sunday against a charged Shannon Blues side. In marked contrast to their previous outing against the table topping Wolfe Tones, the Brighton side could not muster anything resembling a comeback against a relentless Shannon Blues second half drive. The northerners were missing a number of starters from their previous outing, which did not help their cause, and the Blues introduced some telling substitutions in a second half dismembering of their opponents. The first half was evenly contested. The Brightonians opened a two point lead to get things going, and Alan Holland got the Blues off the mark with a point from a free. Thomas Maloney almost goaled for the Blues early in the game, but his high placed shot was well saved by Dean Bourke. The Blues strung three points together after Darren Gilsenan had restored Armagh-Notre Dame’s lead to two, a Paul O’Connor point and one each from play and a free from Holland put the Blues ahead for the first time. 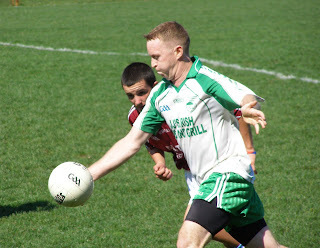 Gilsenan leveled affairs with a well taken point before O’Connor put the Blues one to the good yet again. 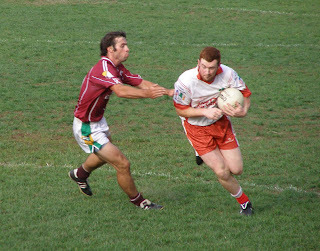 David Quinn netted coming up to half time. With former Cork U-21 Noel Galvin attending to Quinn, the Dubliner was not finding the freedom that he has been used to so far this summer. However, the Na Fianna clubman got on the end of a well worked move to finish well. Holland had the final say before half time with a lovely strike to make it 1-4 to 0-6 in favour of the lads from Ireland’s orchard at the break. Michael O'Brien made a big difference after coming on in the second half. 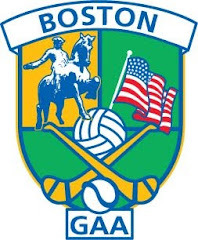 With eleven points guaranteeing a semi-final place one might have expected the big second half push to come from Armagh-Notre Dame, instead we saw the hopes of the Brighton side fade fast as the Blues dominated the second period. 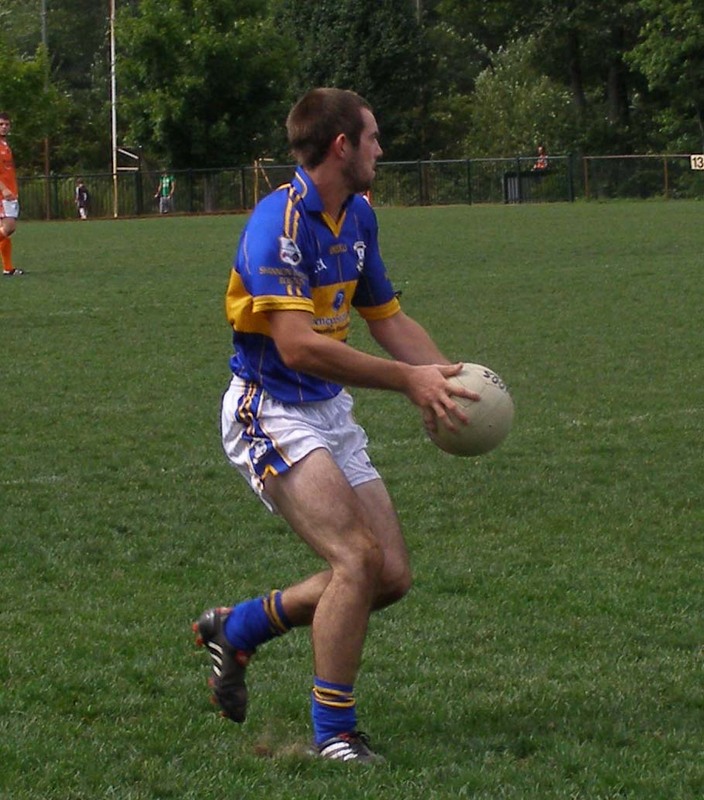 Michael O’Brien, who did not start, came on in the middle for the Blues and last year’s senior finalists lorded it all over the field. 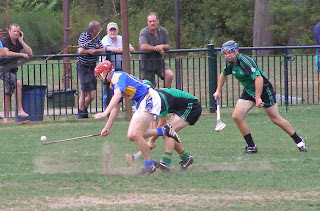 Holland leveled the scores two minutes into the second half, and O’Brien put the Blues ahead with a point shortly afterwards. Blues spirits were high and the commitment level was in contrast to their opponents who had more at stake. The men in orange shirts seemed to be waiting for something to happen, and it was all happening for the Blues. After Denis McElligott added to the Blues lead, Conor Brophy tried to lift things in the middle of the field for the Brighton side, but the end result of three straight wides seemed to accelerate the downward slide. Holland and Liam Jennings extended the Blues lead to six points as the backs eagerly joined the attack. Finally Seamie O’Hare tallied a point for the northerners with less then 15 minutes remaining. Armagh-Notre Dame needed a goal, but it was the Blues who issued the coup de gras with a goal from substitute Justin Burke in a move involving O’Connor and Holland. Holland rounded off affairs with another point. With the final whistle the Blues seemed very satisfied with the outcome, Armagh-Notre Dame on the other hand seemed to have given up the ghost a little too easy. Blues: A. Garry, E. Mullarkey, N. Galvin, JP Murphy, L. Jennings (0-1), C. Fitzgerald, L. O’Brien, P. Murray, S. Sinnott, D. McElligott, A. Holland (0-9), T. Maloney, P. O’Connor (0-2). Sub: M. O’Brien (0-1), J. Burke (1-0). Armagh-ND: D. Bourke, C. O’Toole, J. Cooper, F. Meehan, M. Graham, A. Doyle, S. Dineen, C. Brophy, S. O’Hare (0-2), D. Byrne, D. Gilsenan (0-2), P. Curran, D. Quinn (1-1). Top 4 teams qualify for the senior football semi-finals. 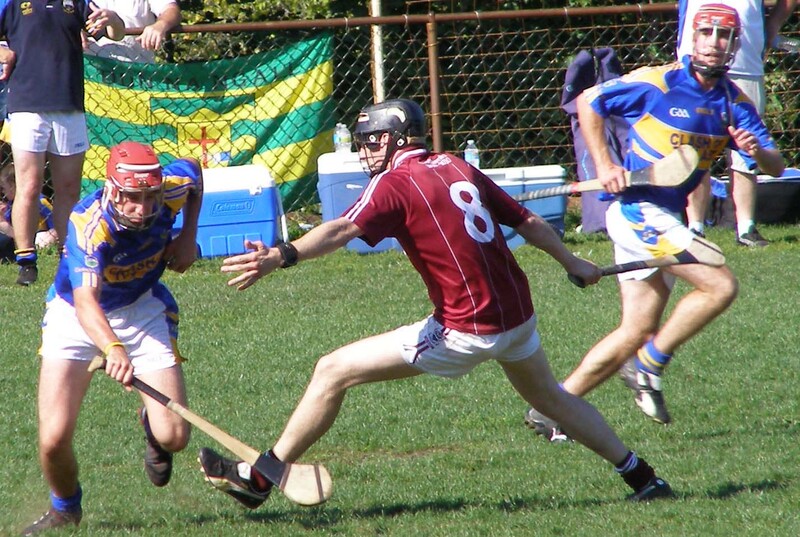 *Cork Hurling won an objection and the points from their first game versus Galway. Top team qualifies for the final. 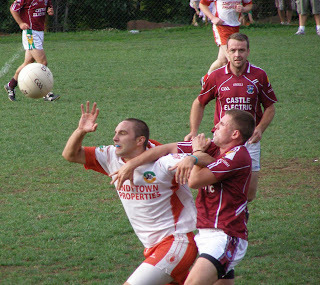 Second and third play in the semi-final. Tom’s earned a point when two were really needed to maintain their hopes of playing into late August. Tom’s fought hard for the 60 minutes, but against a Wexford side containing a handful of players that look like they were born with hurls in their hands, a little more then hard endeavor was required to take full points. 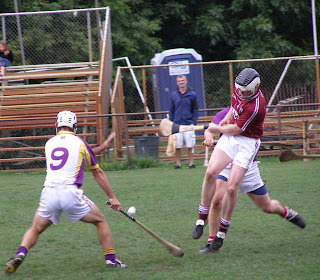 Wexford enjoyed the majority of the possession in the second half, but two goals from Tom’s in the second period resulted in level scores when the final whistle sounded. By the time the first half was done Tom’s enjoyed a two point lead. 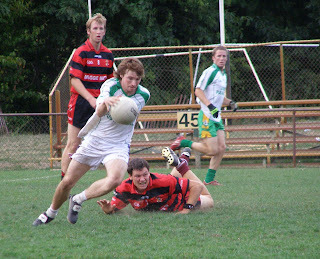 Fran Keenan fired the first three points of the game over from frees, one from inside his own 65. 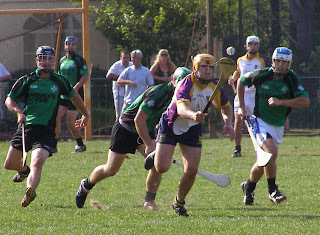 Wexford opened their account with a Gearoid O’Connor point, and that was followed with a score from JJ Kenny. Kenny was on form at center forward for Wexford, and chalked up two more points from play before half time. Ger Reddin got on the scoreboard for Tom’s, and Keenan continued to be on the mark from frees. After Gary Brennan put Tom’s a goal ahead with a point from play, Joe Keane was called on to make a fine save and keep Wexford goalless in the first half. Jamie Kehoe pointed the rebound and at the half Tom’s led by two points, 0-8 to 0-6. ....while his counterpart, Fran Keenan was instrumental for Tom's. Wexford found their form in the second half. 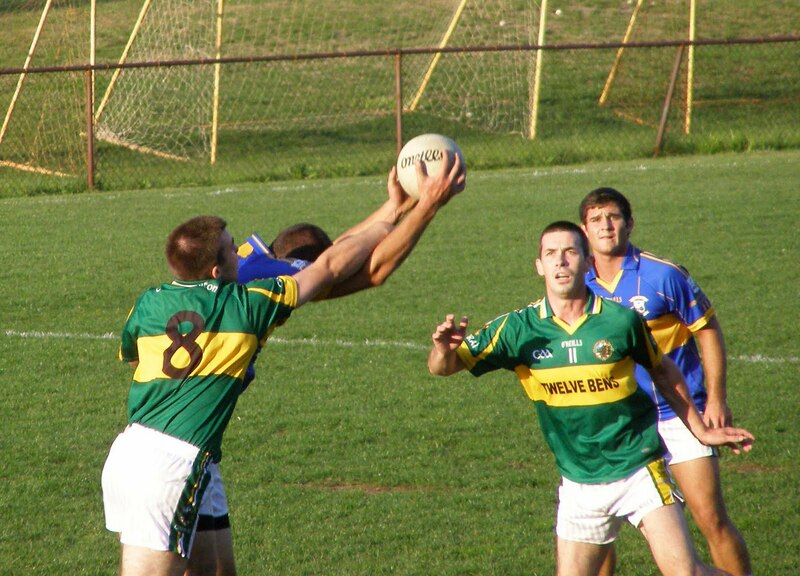 Brian Dalton looked impressive in the half back line, while Kehoe kept things moving in the middle of the field. Tom’s hit with an early goal from a Keenan 21-yard free that was drilled low and hard. 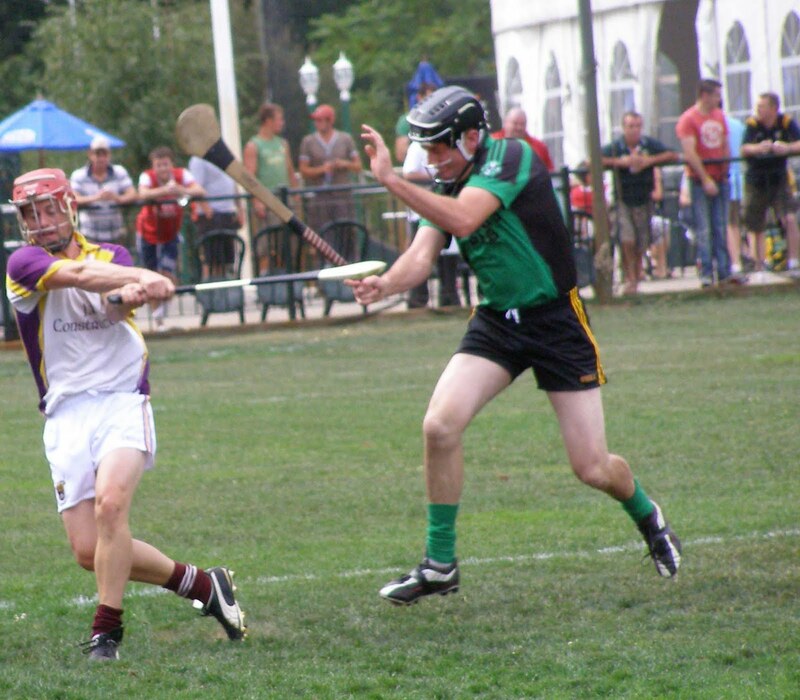 Wexford had a lot of work to do to get back in the game. After Stephen White pointed from a free, Joe Maher took over the marksman duties and did well. Maher put three frees in a row over the bar, and Phil Fanning pointed from play level affairs. Keenan restored the lead for Tom’s with a point from play. After Maher leveled matters again, Tom’s put a second goal away. A long free from Keenan dropped on the edge of the square and it looked like Gary Brennan got a stick to it to put it in the corner of the net. Tom’s now ahead by two points inside the final ten minutes – was a win on the cards for the Tom’s lads? 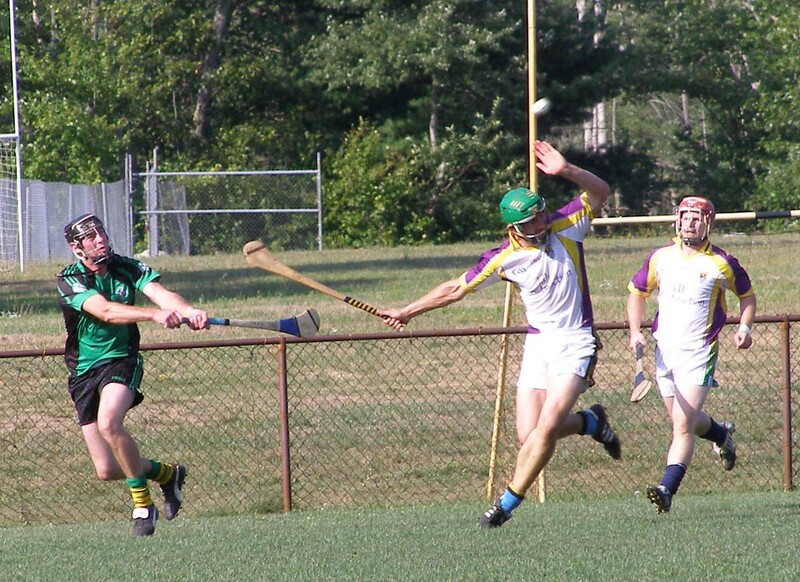 Wexford leveled yet again, Tom Maloney and Maher, who put a great point over from midfield, the scorers. With 26 minutes gone Conor Neylon gave Tom’s the lead yet again as they continued to fight hard for the victory, and Wexford saw Maher miss three shots in a row, one free and two from play. However, Stephen White leveled affairs with a free late in the game and both sides missed chances to win the game down the stretch. The draw suits Wexford as they now sit on 6 points and look good for the semi-finals. Tom’s: J. Keane, S. O’Brien, C. Horan, J. Dowling, D. Moore, D. Neylon, T. Kelly, L. Mulhearn, G. Brennan (1-1) G. Reddin (0-1), F. Keenan (1-7), S. Howley, C. Neylon (0-1). Wexford: G. Griffey, B. Healy, S. Prendergast, D. Redmond, S. White (0-2), B. Dalton, D. Lyng, J. Kehoe (0-1), G. Fennelly, JJ Kenny (0-4), J. Maher (0-6), G. O’Connor (0-1), R. O’Dwyer. Sub: P. Fanning (0-1), T. Maloney (0-1).